There's no place like Lincoln Center—home to 11 of the world’s most prestigious cultural organizations, including the New York Philharmonic, New York City Ballet, Metropolitan Opera, Chamber Music Society, Lincoln Center Theater, Jazz at Lincoln Center, and more. People come from the world over to experience every genre of the performing arts in one place. Our daily, 75-minute guided tours explore our 16-acre campus, tell the insider stories of this iconic destination’s past and present, and highlight hidden gems little known to even the most frequent visitors. Each tour is unique, and you never know what will happen! Are you looking for a customized or group tour experience of Lincoln Center? Specialty, accessible, foreign language, and group tours are available! See the Tour Menu below to find more information. When and where are guided tours available? Daily Guided Tours depart from the David Rubenstein Atrium located on Broadway between 62nd and 63rd Streets. For assistance purchasing tickets over the phone, please call 212.875.5350, or visit us in person at the David Rubenstein Atrium. How long do guided tours last? Tours are approximately 75 minutes. What will I see on a guided tour? Lincoln Center is a busy and active performing arts destination, home to 11 resident organizations. Lincoln Center Guided Tours provide an insider’s perspective of this iconic destination’s past and present. Auditions, rehearsals and performances occur daily, so tour routes throughout our 16-acre campus change every day and are unique to each tour! If the stars align, you may even catch a glimpse of a rehearsal in progress. Please note: Theater availability and hall access are subject to change. We make every effort to visit areas not usually seen by the general public, but we cannot guarantee backstage access. What are the tour policies? Backpacks of any size, instruments, hard-sided containers, and bags larger than 12” x 12” x 12” (30 cm x 30 cm x 30 cm) are not permitted on tours. Bags or purses that are 12” x 12” x 12” (30 cm x 30 cm x 30 cm) or smaller are allowed on our tours. There is no storage area for your items, so please leave them elsewhere before arriving at the David Rubenstein Atrium for your tour. No exceptions will be made. Please note that theater availability, hall access, tour times, and prices are subject to cancellation and change. Please call 212.875.5350 to confirm tour times prior to arrival. All tours are walking tours, so we advise wearing comfortable shoes. Photography is permitted only of our outdoor spaces and in the lobbies of our halls. Restrooms will not be available during the tour. Please arrive for your tour at least 15 minutes before the tour start time. Tours depart promptly, and late arrivals will not be permitted to join. Food and drink are prohibited on tours. How much do guided tours cost? See below for group rates, which are available for groups of 15 or more. **General admission, senior (ages 60+), student (30 and under), and child (6 and under) tickets are available for purchase online. Guests must present identification at the David Rubenstein Atrium to pick up web tickets. For student tickets, a valid student ID is required. There's no place like Lincoln Center—home to 11 of the world’s most prestigious cultural organizations, including the New York Philharmonic, New York City Ballet, Metropolitan Opera, Chamber Music Society, Lincoln Center Theater, Jazz at Lincoln Center, and more. People come from the world over to experience every genre of the performing arts in one place. Our daily, 75-minute guided tours explore our 16-acre campus, tell the insider stories of this iconic destination’s past and present, and highlight hidden gems little known to even the most frequent visitors. Each tour is unique, and you never know what will happen! One of New York’s greatest collections of modern art and architecture isn’t in a museum—it’s at Lincoln Center! Paintings, sculptures, limited-edition prints, posters, and buildings by leading artists and architects can be found both inside our storied halls and out on our world-famous 16-acre campus. The 75-minute Art and Architecture Tour takes a close look at the grand architecture and iconic artwork that graces the Lincoln Center campus, including works by Henry Moore, Jasper Johns, Lee Bontecou, and Marc Chagall. Art and Architecture Tours of Lincoln Center run every Thursday at 1:30 pm. Visit two amazing cultural destinations and save 25%! 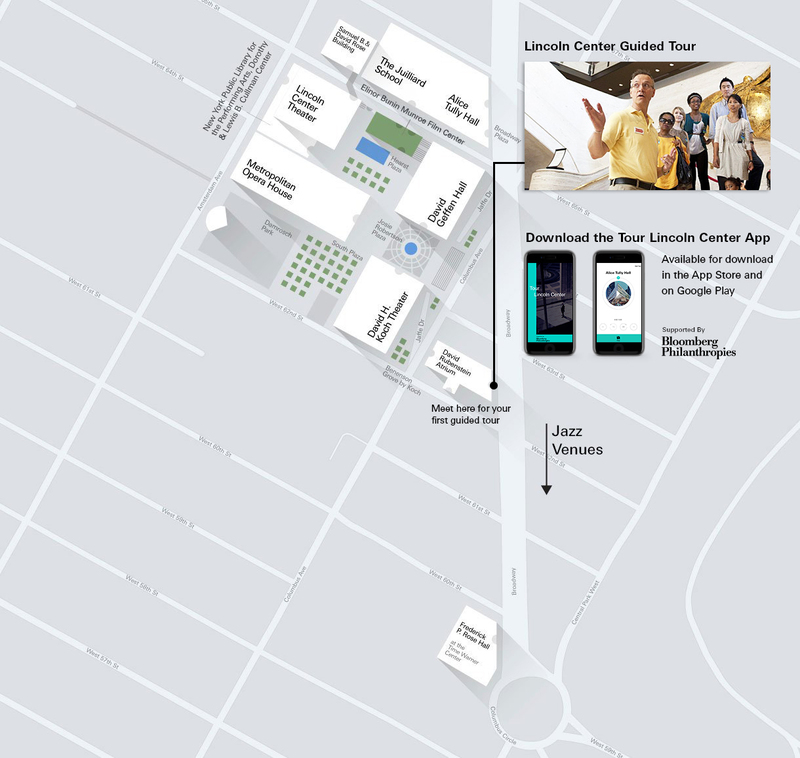 Combo Tours can be purchased in person only at Radio City Music Hall, Madison Square Garden or at Lincoln Center’s David Rubenstein Atrium, David Geffen Hall or Alice Tully Hall Box Offices. Voucher must be redeemed at Radio City Music Hall or Madison Square Garden, as purchased, within 1 month of purchase date. Not redeemable for cash. Not a gift certificate. *Please see website for complete policy and details. Lincoln Center offers numerous amenities and programs to ensure that guests are able to enjoy its campus. Verbal Description/Tactile Tours for guests who are blind or have low vision, and American Sign Language–interpreted and led tours are available with advance notice. We also offer assistive listening devices and wheelchairs upon request. For more information about accessible tours, please contact [email protected] or 212.875.5375. Printed translations of key tour points are available in English, French, German, Italian, Japanese, Korean, Mandarin, Portuguese, Russian, and Spanish. Privately guided tours are available in Italian, Japanese and American Sign Language with advance reservations. To request a Foreign Language Tour, please complete our online reservation request form. Introduce your group to New York’s most iconic arts destination. Exclusive tour packages and discounted rates are available for groups of 15 or more. Group Tours can be booked up to one year in advance and must be booked at least one month in advance. With tours of our famous concert halls and special performance opportunities, Lincoln Center is an essential cultural destination for all ages. To request a Group Tour, please complete our online reservation request form. For more information, please contact 212.875.5350 or [email protected]. 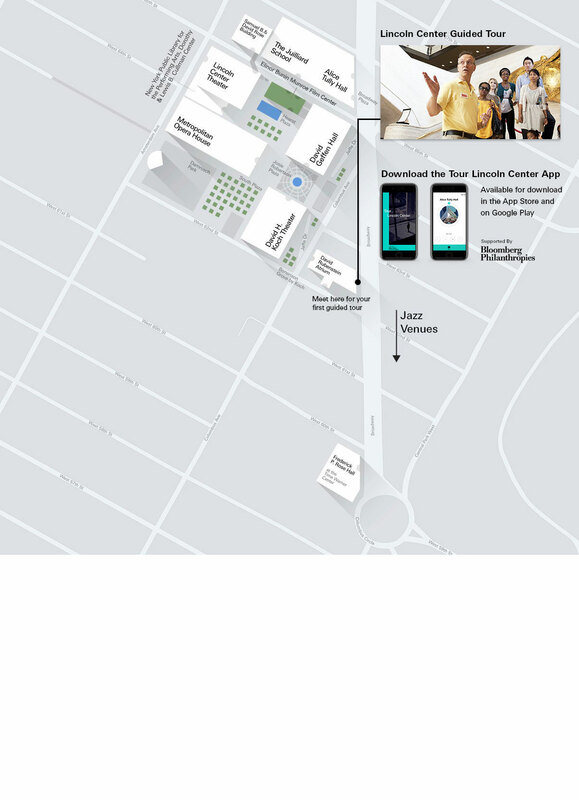 Download Lincoln Center’s FREE Tour App and get ready for a multimedia experience that will introduce you to the architecture, art, famous organizations, and colorful personalities that have transformed Lincoln Center into the world’s most iconic performing arts center. Please note: You can access the lobbies of Lincoln Center’s halls with the app, but you will not be able to go inside the performance spaces. To access these spaces, sign up for one of Lincoln Center’s daily tours.